Bollywood heartthrobs Alia Bhatt and Ranbir Kapoor have been making it to the headlines after they made their relationship public. The power couple is stealing hearts with their adorable gestures and we have been gushing over their sizzling chemistry. During a recent award show, Ranbir Kapoor was presented with the Best actor award (Male) for his extravagant acting in Sanju which features the life of Sanjay Dutt. The actor has delivered one of his best performances so far and he has been a roaring success since then, although it was his acceptance speech which took the audience by storm. It was his gesture towards girlfriend Alia which made her feel the shivers, and she literally shed tears post her lover's speech. However, this time the actress accidentally calls her co-actor and friend Varun Dhawan as Ranbir Kapoor. During a recent media interaction Alia wanted to stop Varun from doing something but says, "Ran umm, Varun don't." 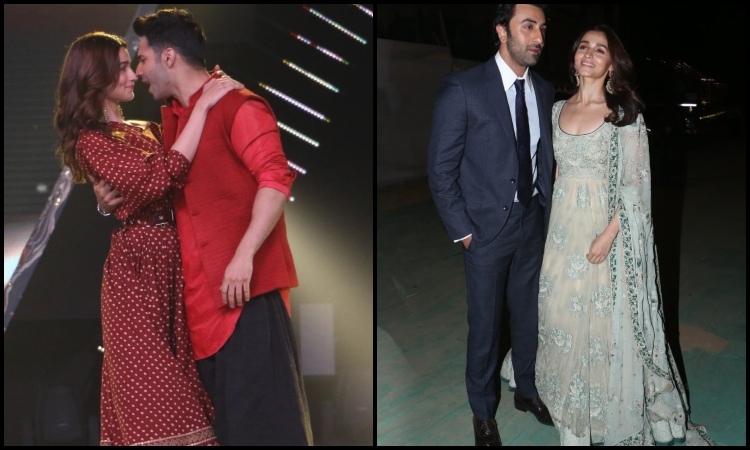 Immediately, all her Kalank co-stars Varun Dhawan, Aditya Roy Kapur and Sonakshi Sinha start pulling her leg while Alia cannot stop blushing. What's interesting is the spontaneity of her expression after she says Ranbir's name. Seems like Ranbir has already etched his name on her heart and we just can't get enough of it! Do you think they make the perfect match for each other?